Inspired by wood joinery and mechanical puzzles, Kollar is a fastener-less stool designed for the urban living environment. When designing the stool, I set a few design criteria I wanted my concept to meet. These acted as guiding principles throughout the design process, and influenced much of the decision making. Inspiration was drawn from types of wood joinery and 3D puzzles, the way in which pieces can be interlocked to create structure. This is where the idea of the legs creating a collar fit around the seat originated. 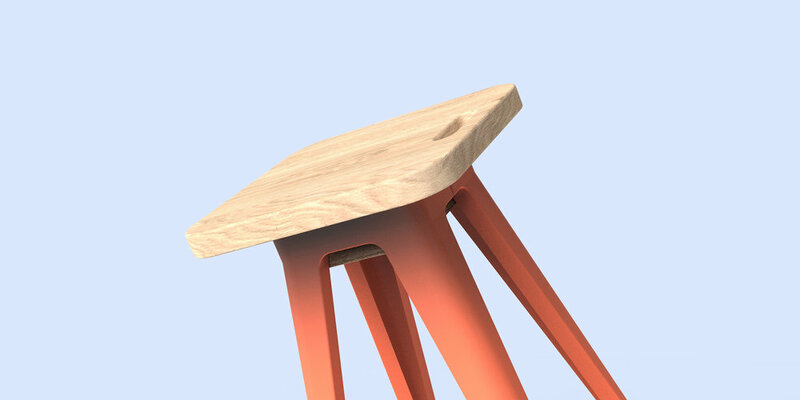 The final design is a three-part stool assembly made up of the two legs and the seat. The legs connect via magnets around a sandwiched seat assembly. The stool can be just as easily disassembled, and with steel pucks under the seat the legs can be attached for a slimmer profile. There is enough clearance to use the handle cut into the seat to easily move the stool. In terms of manufacturing, the legs would be made of recycled polypropylene rotationally molded for its rigidity and lightweight. The seat on the other hand will be three layers of birch wood fastened with screws. The magnets and steel pucks can finally be glued into position. I had the opportunity to prepare a scale model to test the simple joinery and gauge proportions. Utilizing a 3D printer for the legs and a few pieces of bass wood for the seat resulted in a detailed model. A full scale prototype was an objective for this project but I had never crafted a piece of furniture up until this point. I took the opportunity to develop my modelling and wood working skills. Overall I am pleased with the outcome of the stool, mainly proving the structural integrity of the design. Unfortunately due to time and material limitations I was unable to prototype the storage ability aspect. I was honoured to receive the first place award at the 2015 Andreu World International Design Contest.